OneLink deep links detect the user’s device and whether your specific app was already installed. 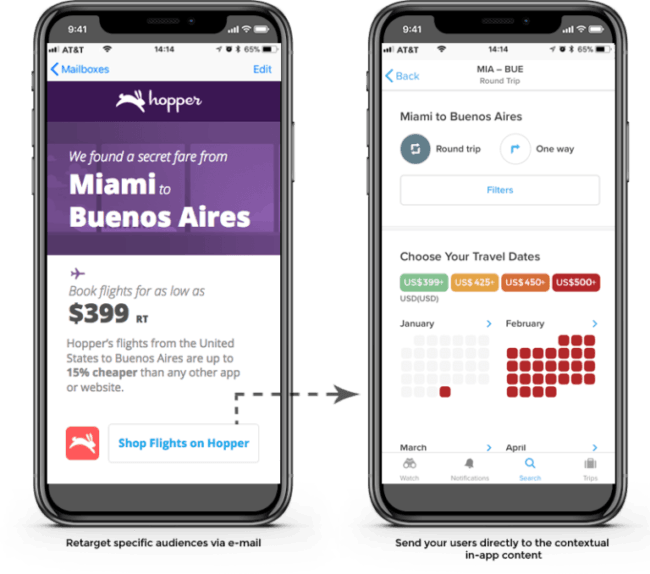 Using deferred deep linking, new users will be sent to the right app store first to download the app, and then, sent to the contextual content after launch. Our deferred deep links go a step further. 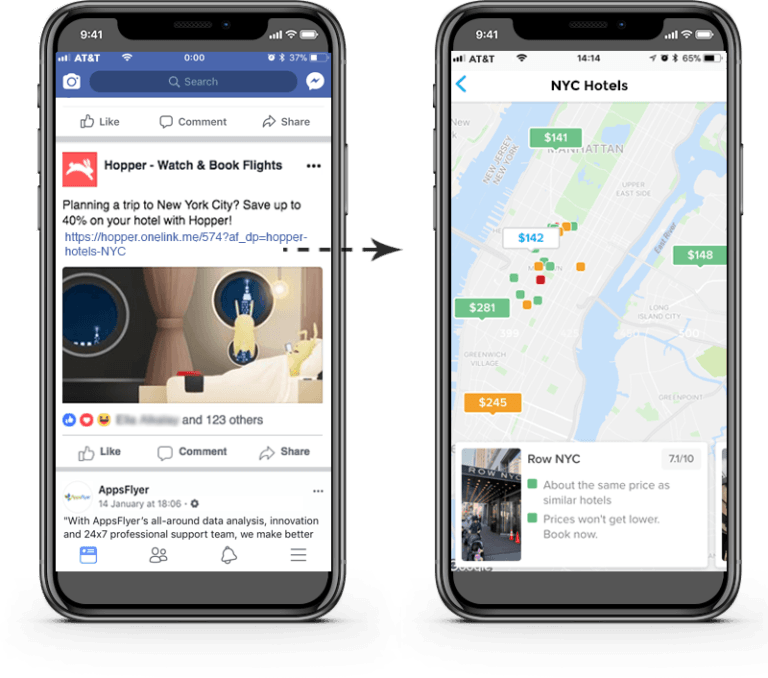 When the new user installs the app, AppsFlyer passes information such as the referrer name, the campaign, promo code, discount and more to the app, delivering a contextually relevant experience based on these data points as soon as the user launches the app for the first time. Users who already have your app installed will be sent the contextual in-app content automatically. Provide the ideal customer experience, measure and optimize your CRM messaging and email marketing with OneLink universal deep links and app install attribution across every touchpoint. Everyone knows that word of mouth referrals provides one of the strongest mechanisms to spread the app and create virality. Text message and SMS is the digital equivalent of this whereby friends can share great new apps with their friends. OneLink deep linking technologies enable marketers to dynamically create short URLs to share the app or a referral program. When users click the link, they get an optimal experience – going to the app store if they don’t have the app, and to the app if they do. And of course, every new install will be attributed to the right message, channel and campaign. Measure every download that comes from your social media posts, whether they are on Facebook, Twitter, Quora, Pinterest, Instagram or Snapchat. You can even run promotions that incentivize your fans and followers based on how many downloads they can drive. With OneLink deep linking, every click and every action is always measurable. Always. When an existing user wishes to ‘invite a friend’, he will be prompted to select how he’d like to spread the word; SMS, email or social. A deep link will be automatically generated for easy sharing through the desired channel. Once the invite is sent, you will be able to track the users that are most likely to invite friends, as well as their preferred channels. 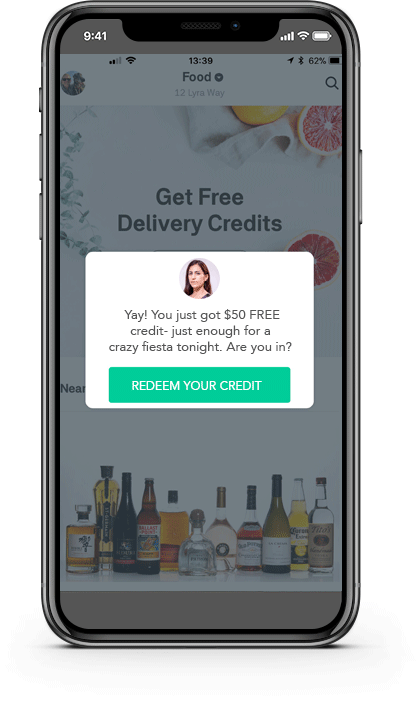 When the newly invited user installs the app from this link, AppsFlyer passes data such as the referrer name, his avatar, the campaign name, promo code, discount and more to the app, and allows you to use this data to provide a welcome screen or customized onboarding. 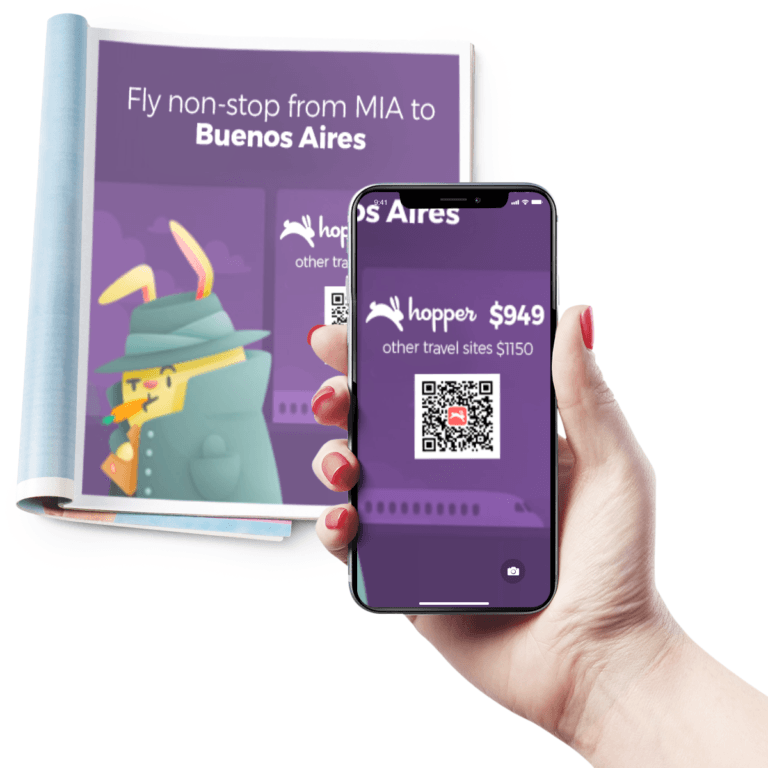 With AppsFlyer’s User Invites, hacking word-of-mouth is easy. It’s about a unique and share-worthy experience. OneLink powerful deep links allow you to use the data you share in links to provide a welcome screen or customized onboarding. Having a sale? Featuring amazing content in your owned media channels? When users click on your link across your owned media channels or even in SMS & referral links, you can use the collected information (e.g what campaign they come from, who referred them, the promo code, what content they want to see and more), to welcome your fresh users with a personalized onboarding message. Every OneLink deep link includes a QR code and it’s own custom short URL. Put a OneLink QR code or vanity URL on your billboards, print ads, brochures, sales material or product packaging to measure their click-rate and conversion-rate, attribute these installs to the right campaign and optimize your performance. Measure which content your users share and enhance the recipient’s user experience with OneLink. 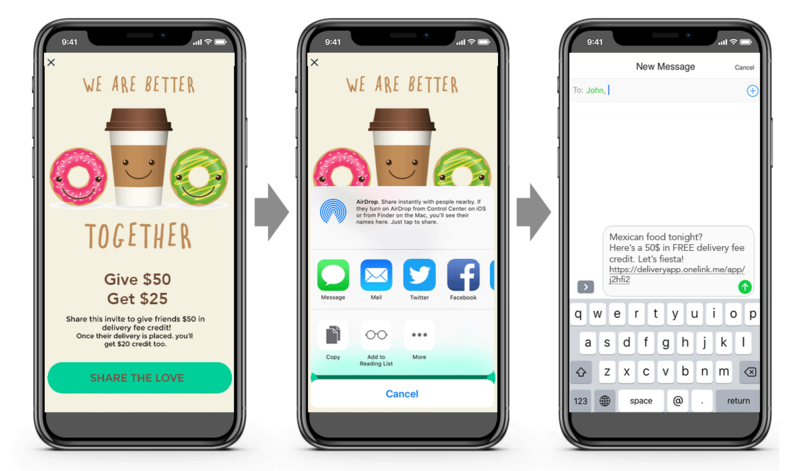 You can even configure OneLink deep linking to measure how many times each shared link was clicked and re-shared, creating an amazing platform for incentivizing sharing as part of promotions. Using OneLink universal deep linking, it’s easy to measure the performance of each marketing message — whether it’s on your social media pages, email marketing, print materials or even a billboard. 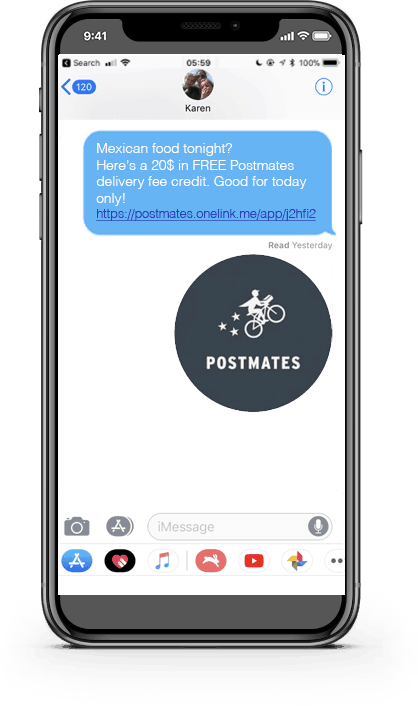 Look to your top performing messaging to determine which messages attract the right mix of scale, retention and in-app conversion.